We had hired a couple of bicycles that didn’t work that well and a guide who didn’t show up. After waiting 15 mins in the complete darkness outside our hotel at 4am we decided to try and give it a go by ourselves. Head torches strapped to our foreheads (seriously there was NO light!) we started off in the direction of Shwetaung Paya in hope that we were going the right way. Passing the market sellers who were just setting up, we saw a big hill, we were close but not exactly sure where it was we were supposed to be. At the bottom of the jungle laden hill was a man sleeping on the side of the road in some sort of shack, he was our only hope. Saying the name of the Pagoda ‘Shwetaung’ whilst making a confused face he seemed to get it, he pointed to the top of the hill, so that is where we needed to go. Dropping our bicycles into the bushes (there was nowhere else to store them) and with headlights still on, we began to follow a pathway up the hill. As we continued up, the path became less and less clear, turning into thick, dense jungle more and more. No idea if we were about to take a wrong turn on not, Philipp luckily has a good knack for directions, and the path he choose was the right one. It was also the steepest and we had to do some elbow chops to get through the flora and fight our way through the mountain rainforest. Up to 8ft tall vegetation with heaps of spiky plants! I was sure this couldn’t be the right way, but it was also kinda exciting. We made it Just at the crack of dawn with the full moon still shining above, we arrived on top of the golden hill, welcomed by two golden statues, and a pagoda that seemed to be half taken back by nature and the surrounding vegetation. 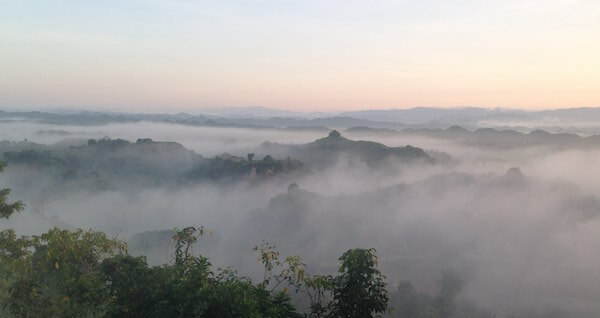 We got a 360-degree view all around Mrauk U, overlooking mountains and hills as the sun rose over them. Even the massive complex of Shittaung Paya and Dukkanthein Paya were visible. The entire time we were watching, the sunrise was truly spectacular and mesmerising. Beginning with a clear sky as the sun rose up, suddenly a misty magical fog also began to rise. The fog came up leaving only the tips of the hills visible. Even better, other smaller pagodas, built on top of the mountains, popped out through the thick mist. The mix of misty fog clearing then coming back then clearing again over the hills of temples and pagodas that dotted up over the mist, plus the location of the slightly creepy forgotten pagoda that we were standing on, there was a sense of sorcery to it, I didn’t want to leave that moment! But it was already daylight and warming up and there was a full day of exploring Mrauk U to do. I highly highly recommend checking out the ‘Golden Hill’ or Shwetaung Pagoda if it’s the only thing you do in Mrauk U! It is on the highest hill in Mrauk U and although is tricky to find if you just keep going upwards through the thick vegetation you will find the spot. The sunrise from the top of this hill gives Bagan sunrises a run for their money, just magical! Trekking in the hills surrounding Mindat is an unparalleled experience: breathtaking views, turquoise blue rivers, rickety bridges and undiscovered hiking trails. In the winter months, it gets unexpectedly cold and having a hat, gloves and warm jumper is a necessity. We would meet locals on the way, who would show us their humble homes built in the middle of nowhere, smile and shake our hands. Many villages around Mindat are accessible only by a motorbike through a labyrinth of trails. Chin people are one of the friendliest people I’ve met in Myanmar. Despite of harsh life in the mountains, Chin people are considerate and care for each other. They would always strike a conversation or smile back at us when we were passing by in their villages. Some nights we would sit with them at a bonfire, sing songs and drink millet wine, others we would watch them play darts at a local bar. Just before sunset, the whole village would watch their kids playing football against kids from neighboring villages. The families & friends would come together at Christmas time or during festivals and share food and spend precious moments. Not being able to speak their language, we were welcomed in their social circles. For those seeking mountains and nature in Myanmar, visiting Chin state should be on their travel itinerary. There are more hotels in Mindat each time I go and the road is slowly getting better. The locals speak enough English to help you and local tour guides would prepare an itinerary that fits you. It’s still wise to hire a guide as they would be able to connect you with local communities easier and some remote roads are extremely difficult to ride without practice. On the opposite side of the province of Phuket in Thailand is the Mergui Archipelago in Myanmar a gem in the deep south of Myanmar just opened up to tourism. Myanmar could easily become a traveler’s favorite destination. The locals in Myanmar are genuinely happy to see a tourist. They really want you to have a great time in their country. Tourists are unique and cool which is why they want to take a selfie with you to share this with their family. This was our number one surprise when visiting Myanmar. The temples area of Bagan contains over 2200 small and big temples (pagodas). You can explore the African-looking area by bike or e-bike! Bagan is in the running to become the next UNESCO World Heritage and is closing temples from watching the sunrise on the top. A great reason to visit Myanmar now! Just outside of Mandalay in Mingun is the beautiful all white circular-shaped Hsinbyume Pagoda. Climb via the stairway to the top and have a great view of the river. Perfect palm trees lining all along the coast, turquoise water, and white soft sand. Ngapali Beach is a dream beach with not many tourists. Explore the 7-kilometer beach area by bike. Ngapali easy to reach with a domestic flight. Tourism in Myanmar is on a rise but this is nothing compared to Thailand. About 10 times less tourist to be exact. In 2017, Thailand had over 35 million tourists whereas Myanmar had almost 3.5 million. The countries are about the same size, so there is a lot to discover and you will only meet larger groups of tourists in Bagan. Floating in between 2200+ temples while you slowly feel the comfortable heat of the rising sun on your face. Experience Bagan in a unique way by a sunrise balloon flight. Complete villages made of wood and/or bamboo are living on the waters of Inle Lake. See how the local people work in the floating gardens or on their fishing boats. Visit the long-necked women and clothing factories. To hike up the small Hpan Pu Mountain, you will need to catch a local canoe boat, pass the river and walk through a village where they grow vegetables. From to top of the mountain, you will have a beautiful view over the area. This area is pretty much disconnected from the normal road so expect a lot of surprised faces when they see you, a tourist. One of Asia’s lesser-known cuisines, the Burmese Cuisine. Seafood and plant-based meals served with rice are basically in every meal. Like it’s neighboring countries, spices are used to make the dish flavorful. These were our absolute favorite places to eat in Myanmar. Hpa-An is green rice fields area dislocated from the usual tourist route. In Hpa-An they grow rice multiple times a year so you will have a good chance to wander through the fields. Imagine the Phuket region in Thailand without tourists. The Mergui Archipelago lies in the Andaman Sea off the coast in the deep southern tip of Myanmar. At the moment, this part can only be visited by guided boat tour. In the former capital, Yangon is a 99-meter high gold pagoda. One of the countries most famous sights. It is also known as one of the old pagodas in the world. Make sure to experience this beautiful pagoda at sunrise. Highly underestimated Mingun Pagoda on the Irrawaddy river, which is about 90 minutes from Mandalay, is a huge square-shaped pagoda. On a few sides, it has been damaged by a heavy earthquake, but we thought that made it even more special. Near Mandalay is the longest wooden bridge in the world. A 1200-meter long wooden footbridge over shallow water. It draws many visitors both local and foreign. In between Yangon and Hpa-An is the world-famous Golden Rock. At 1100 meters in the sky is a 20-meter high golden rock seen as the most important Buddhist site in Myanmar. It’s quite an experience to reach to top from the base camp by bus. If you’re up for a real hike, then get out in the early morning and test your hiking skills on a 2.5-hour journey to the top of Mount Zwekabin in Hpa-An. You will get rewarded with an insane view. One pagoda with 729 smaller white pagodas surrounding it all containing a marble stone book page. Together they form the world’s largest book. The Kuthodaw Pagoda is located in Mandalay and a must visit. A forgotten field of 1600 pagodas, west of Inle Lake and only to reach by boat through a narrow creek. Be sure to visit in the right season, in summer the creek is dry and you aren’t able to reach the pagodas. We often get the question, is Myanmar safe? The answer is YES! Myanmar is safe to travel. The horror stories you’ve read in the news are true but don’t forget Myanmar is huge and the locals can’t help what has been going on. Try to spend your money with the locals so those people will stay positive and can live their normal daily lives. We haven’t felt unsafe for a single second! We shouldn’t forget that the locals and government are not the same people. Capital: Hpa-an | Population: Over 1.6 million | Languages: Kayin, Myanmar | Major Industries: Agriculture | How to get there : Car, Bus, Air, Train | Traditions and Culture: The Kayin are deeply religious, whether they are Christian or Buddhist. Their New Year, which falls in December, is the most important event in their communities. They are living along Thailand and Myanmar side of the river. It’s about 2,815 kilometers (1,749miles) long that flows the Tibetan Plateau into the Andaman Sea in Southeast Asia. From the source to the sea, it supplies food, creates culture, and shows off its natural beauty to ethnic minorities along the way. The capital of Kayin State, is a beautiful town with wide lakes, lush islands, limestone cliffs and soaring peaks, with mountains ranges receding into the distance. Mt. Zwei Kabin is the pride of Hpa-an. It is 772 metres (2,532 feet) high. Of striking beauty, brick steps lead to the summit, where climbers are rewarded by panoramic views. A trip on Yangon's Circle Train is an easy and authentic way to experience life in and around Yangon .The trip starts out downtown at Yangon Central Railway Station and travels in a clockwise direction in a wide loop of the city giving an inside glimpse of urban life,bustling markets and stretching into the green paddy fields and farms on the outskirts of the city before returning. The trip takes 3 hours and tickets cost 200ks. The practice of meditation is helpful for making your mind calm and peaceful. In Myanmar today, meditation is thriving among not only the old but also the young. The Mahasi method is based on breath and the sensation of the rising and falling of the chest and abdomen caused by the intake of air. The Mogok meditation method focuses on the feeling of incoming and outgoing breath. Most people who practice meditation prefer the latter. There are two kinds of religious meditation: Vipassana and Samahta. Both have 40 subjects of meditation each. If you take one of them, it is considered an act of leading towards enlightenment as well as the renunciation of desire in order to attain nirvana. Samahta is to focus on one thing to attain tranquility. For example, when you suffer discomfort or pain in your body while meditating or if it is difficult to slow the mind and avoid thought, participants are encouraged not to focus on them but instead on the incoming and outgoing breath. Samahta is to control the focus and concentration of the mind. There are no levels in Samahta meditation. Vipassana, on the other hand, is a way to focus on all things and feelings happening during breathing in and out, as well as on the deep interconnection between mind and body. Today, more and more international visitors are seen practicing at meditation centers around the country. They often make their beginnings in meditation through Buddhist missionaries abroad. When they are visiting Myanmar, they choose to spend time learning the Myanmar Buddhist methods of meditation. Those who correctly practice meditation experience both mental and physical benefits. It makes the mind calm and peaceful and can relieve worries and anxiety as well as beating stress and sadness. It is said that those who regularly practice meditation can more easily deal with difficulties and adversities we may face in life. The Museum is about a 30-60-minute drive from downtown Nay Pyi Taw, depending on how lost one get on the roads, unfamiliar signs, and buildings that essentially all look the same. When I arrived at the main gate, I was required to leave my ID card or passport there, with no admission fee. I had less than one hour to spare before leaving the city. To be honest optimistically, it didn't dawn on me how big this place was until I got inside. This is most likely the largest museum in the world, and it should be in the Guinness Book of World Records. So big, one would need a car to get from one building to another, or at least using a golf cart. The ‘Grand Daddy’ of museums indeed! The buildings are designated for Army, Navy, and Air Force sections. Heading out to the museum buildings, I passed by a field of old airplanes including WWII Spitfire planes, feeling being saluted by old fighter jets and helicopters in a row after a row. Right! I got into one building that houses the old cars for consecutive presidents. It is square-shaped with a football field sized lawn in the middle. Guards were present, and they seemed to know exactly where things are. They are very helpful with directions if you can describe appropriately. The entrance of the massive building welcomed me with a small plane. Fierce looking dogs were running along the corridors, and some were waiting, looking like they were guarding the doorway. The place is grand. The flooring of walk way and corridors is made of marble or granite slabs. The corridors are about 15 feet wide. The building reminds me of buildings designed by Russian architects in the mid-1950s, resembling the Yangon Technology University, University of Medicine-1 and Inya Lake hotel in Yangon. I really did not have much time. At this point I was literally running down the corridor looking for the right door to get to my expected destination. I saw “No Smoking” signs as a uniformed person walked passed me with a cigarette in his hand, wearing a fake gold watch and talking loudly on his mobile phone. It must have been lunch time. Cleaning staff came out of a storage room with their lunch boxes and their children. I wondered if they actually lived in these storage rooms. Some women were holding young children in their arms, being followed by several dogs hoping for scraps. I finally arrived at the Directorate of Supply and Transport Showroom. I quickly passed by an old military medical vehicle from the 1950s. Old medical supplies and radiation equipment were displayed in series of glass cabinets. Also in display were photographs of military personnel of different ranks along with artillery shells of different sizes and shapes. There also was a collection of yarn for military clothing and blankets, a strange addition to a defense museum, but I can understand that fabric can be an important factor during the times of war. Looking at shelves after shelves of little miniature military cars and trucks, various uniforms, hats and boots on display along the hallway, I had found what I came to see at the far end: A 1938 Rolls Royce Phantom III and a bullet proof Packard, parked side by side. That British luxury Rolls Royce was the car of Myanmar’s first president Sao Shwe Thaik. An incredible thing about this museum is that you can touch almost anything on display! Unlike in other museums, I can pose for pictures next to the car as I ran my fingers across the hood of the car. I was truly beginning to love this place in all its strangeness, and I wish I had a couple more days to explore the other 10 buildings.